For those iOS users who would rather use Microsoft Edge than Safari on their Apple iPhone and iPad devices, an update is now available. Taking the mobile version of Edge to version 42.1, the changelist includes an improved Hub design, the usual performance enhancements, and a way to display shortcut keys on an iPad. To do the latter, simply press the command key on a keyboard attached to an iOS powered tablet, and the available shortcut keys will appear on the screen. With the Edge app on your phone or tablet (there is also a version for Android), you can browse on your desktop PC; when you need to go out, use the mobile Edge browser to continue what you were doing at home. Passwords, content and favorites sync from the desktop to your mobile device. 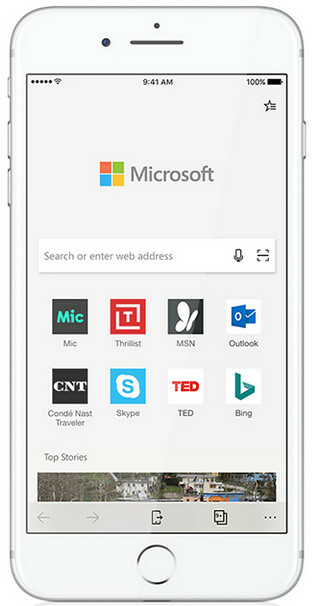 UPDATE: The Android version of the Microsoft Edge browser is also getting updated. This will take the app to version 42.0.0.2025. It adds support for Microsoft family accounts. Adults with such an account can decide which websites their kids can and cannot visit using Microsoft Edge for Android. You can update the app by going to the TestFlight app on your iPhone or iPad, and updating Edge. If you don't have the mobile Edge browser on your iOS or Android phone/tablet, you can receive an invite by clicking on this link. I use chrome on Windows and Samsung Internet on mobile. I'm gonna get an iPad which will further complicate things so I might switch to this on all platforms. Is MS Edge anyday better over chrome on Windows? This item isn't available in your country .. Why will a web browser be limited t9 certain countries anyway?